Magnetic hills: do they contain a piece of magic? You are standing on the top, but you claim to have leapt on the bottom. The power of optical illusions breaks the stereotypes and argues with laws of nature. Having hidden beside the mountains, optical illusions add some sort of mystery to the so-called magnetic hills. They demonstrate the wonders and tricks of unbelievable nature in many corners of the world. We will talk about the most famous sites. India is famous not only for the ancient temples where gods used to reside. There are several magnetic hills; each of them has a head-spinning story. Not far away from Leh Leh Mera Khana (Ladakh area) some magnetic hill makes true wonders. 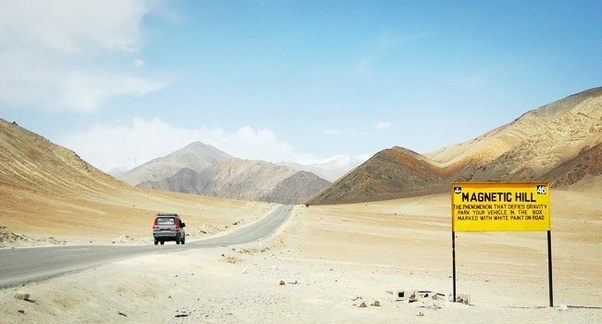 30 kilometers are between the magnetic hill and territory of Leh, but this small distance has managed to change the law of gravitation. It seems that this hill is able to push cars. Moreover, planes try to gain altitude while flying over the hill so as to avoid the electromagnetic disturbances. Well, religious people of India are sure that breaking gravitation is possible because of spiritual reasons. The legendary saint Guru Nanak was told to meditate on the slope of this hill. Locals are convinced that his meditation turned impossible into reality, and nowadays the hill has an ability to operate the space. Actually, all the aforementioned factors are nothing more than an optical illusion. Because of terrain peculiarities, the slope looks like it lifts into the sky an illusion created because the horizon is invisible, partly or completely. Without seeing the horizon, it becomes impossible to take considerations about the bent of the surface. The objects that are usually more or less vertical to the ground might have inclined to cover for visual factor. Black Places: Are they connected with dark forces? Other magnetic hills in India are located in Gujarath area. One is called as Black hill (Kalu dungar) while another is known as one near Tulsi Shyam. Kalu dungar is the place of worship and the space to watch the wonders. For instance, a long time ago several travelers were astonished because their cars hurtled down the hill with the speed of 80 km/h or even more. The scientists from Disaster Management Authority of Gujarat and Seismological Research Institute came to conclusion that slope has almost invisible gradient that makes cars hurtling down faster. Definitely, local citizens recall the legends and myth trying to explain an interesting phenomenon. For instance, there is 400-year-old temple of Dattatreya. So, all the beliefs are somehow connected with this deity. They tell the stories how Dattatreya felt pity towards hungry jackals and gave his body to eat. Even though this story does not correspond with the laws of nature or human existence, the locals believe in it as well as in the paranormal power of magnetic hills. The story of Magnetic Hill in Canadian city Moncton harkens back to the 19th century when the cart path appeared. By the beginning of the 20th century it became wider. However, in 1931, somebody paid attention to the fact that at one point that goes up drivers tend to drive backward. This is how people for the first time started talking about the optical illusions which could confuse even the most curious drivers. The visitor who especially came to Moncton to try it out, were completely surprised! They told, according to the laws of gravitation, their cars could not have rolled uphill. But they did. So, when one faces the wonders of optical illusions, the brain sensibility is numbed completely.